Other than the drab and uniform plumage the most striking feature of our quiz bird are the long wings, which reach almost to the tip of the tail. Only a few groups of birds have such long wings, including gulls, terns, shorebirds, swifts, hummingbirds, a few raptors, a handful of flycatchers, and swallows. Gulls, terns, and shorebirds can be ruled out immediately by leg length, foot shape, and overall proportions. As a rule, swifts don't perch on tree limbs, and the notched tail of our quiz bird is all wrong for a Chimney Swift, the only swift that has been recorded in Illinois. A hummingbird would be green or red on the back. The raptors with long wings usually have barring or spotting on the upperparts and tail. The feet on our quiz bird don't look "raptorial" either. Flycatchers have longer tails. This bird does have the look and feel of a swallow, but which one? A Bank Swallow would have whiter underparts and a paler rump. Barn Swallows of all ages are bluish on the upperparts. Very young Tree Swallows are brown on the back but would have whiter underparts. A Cliff Swallow would have a discrete buffy patch on the rump. Purple Martins have bluish upperparts. 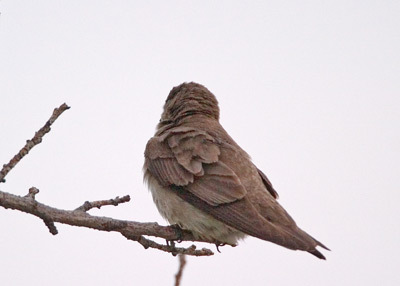 That leaves Northern Rough-winged Swallow which is what our quiz bird is. We can go a step further and age this individual as an adult, since juvenile Northern Rough-winged Swallows have rusty wingbars. This adult Northern Rough-winged Swallow was photographed by Eric Walters on May 17, 2004 at Northwestern University in Evanston.